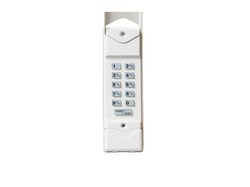 The Model MDTK Keypad Transmitter is one of Linear’s MegaCode series of wireless radio controls designed for use with automatic garage door and gate operators. The MegaCode radio format provides unparalleled security with more than a million different codes. In operation, the user enters their unique code on the unit’s keypad (1 to 6 digits long) and presses the START/STOP button to activate the door operator. For up to 30 seconds after the last activation, the MDTK can be re-triggered by simply pressing the START/STOP button again. This allows the user to stop or reverse the opener quickly, without having to re-enter their code. You can view or download the following Linear MDTK keyless entry programming instructions.